This vintage looking map card is for my husband’s birthday today. I am not suggesting he is vintage, far from it as he is only one week older than me! 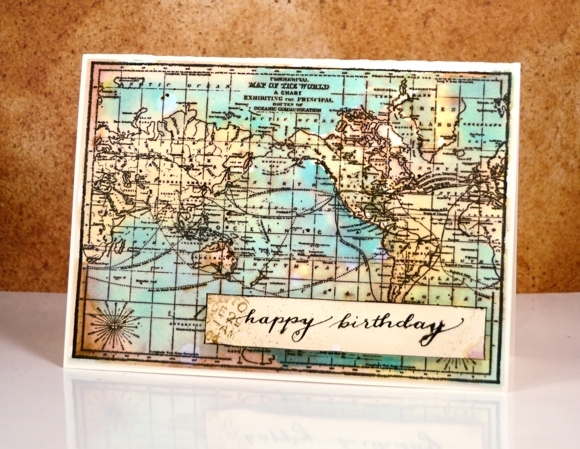 I used the world map background stamp from Darkroom Door and distress stains to give it an aged look. I began by stamping the image on hot pressed watercolour paper in versafine onyx black. Versafine is a pigment ink so I knew it wouldn’t bleed when I added stain and water over the top. I added vintage photo distress stain over most of the panel first then followed it with more distress stain and water (colours listed below) loosely filling the oceans in blue and the land in yellow and green. When the panel dried I added some water splatter and stain splatter. Up until this point the process had been fairly quick but then I started playing with sentiment ideas. The one on the card is probably attempt no.217! I went through several different wordings and a couple of paper types and nibs before I resorted to something simple. Once I had written it satisfactorily I dropped water on it, extra stain and added a little postmark which just happens to be from a place where I lived the year before we were married. Sweet words like “I’d travel the world with you” were not to be. Don’t get me wrong I would travel the world with him and did travel from one side to the other 16 years ago. My simple wish with a pointed pen and ink and lots of love! Heather, I love your cards. You have introduced to so many things. In fact I have a question. I really want to try colorburst or brushos, and I was wondering which you would recommend for a first time user. I am playing with my watercolors and love them. I get so excited when I see your work. Hi JoAnne, I am so glad you are getting inspired by the projects I’m sharing. If you are picking one paint powder I would start with brusho; although I love both brands. The brusho crystals are not quite as fine so do not spread quite as far. When you get the brushos don’t take the lids off just put a push pin through the lid to give you a little hole to sprinkle them out then when you have finished using them seal it again with the pin. Thank you so much Heather, That really helps me. I forgot to ask about the hot press paper compared to cold press. Could you explain? I love the vintage map colouring on this. Hope it was a happy, celebratory day!